What are those numbers of ? 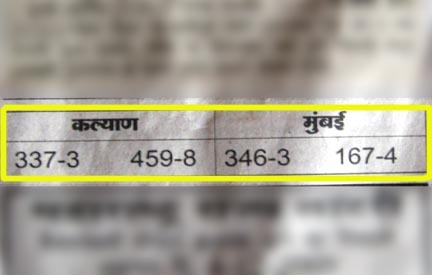 In Tarun Bharat these numbers appear every day on the last page or last but one. But there is nothing mentioned about those numbers as what are they off. Yes most of you got it correct. They are results of opening and closing of Mataka figures. In the fifties there was cotton feature number game based on the fluctuating prices on cotton market in US. In those days people used to minutely observe the cartoons appearing in English daily s and bet on numbers. Mataka is a very interesting game.There are hundreds of theories practiced by punters. It is almost a number game. There is one sun and nine planetes [grahas]. Sun indicates ZERO. A powerful digit. One to nine digits indicate nine grahas [planets]. Many a punters refer panchangs and bet. 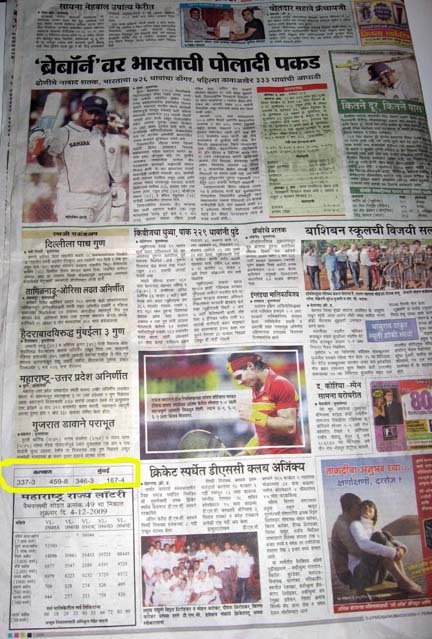 Funny Answer : It's a 5 day Cricket Match Score in which Kalyan won against Mumbai Team !! Actual : It is result of Mataka Gambling !! now u all know whats this…………. do any one think of stopping this? come forward lets do something………. lets rise voice against this…..
ther are results of opening and closing of Mataka figures. In the fifties there was cotton feature number game based on the fluctuating prices on cotton market in US. In those days people used to minutely observe the cartoons appearing in English daily s and bet on numbers. Mataka is a very interesting game.There are hundreds of theories practiced by punters. It is almost a number game. There is one sun and nine planetes [grahas]. Sun indicates ZERO. A powerful digit. One to nine digits indicate nine grahas [planets]. Many a punters refer panchangs and bet. Hi….! This is Rahul Magdum. I feel Very Interest in Mataka Game. Is you have any Theory to Play Matatka pls send me by mail or You Just call me on +919890685086 number. Before closing tell you frankly …. I never played a Mataka till date… But if we Educated people take interest on this sectore …. Surely we can achive hights of Success. does this no's really matter to us..?? there are some ppl who r addict's to it.. n logically he aint commitiin any crime by puttin up these no's here.. if dat wud have been the case then they wud have banned it right away..
Its The MATKA Numbers… Many People Bet On The Numbers Ranging From 1 to 100 Plus Some Single Digit… Its Like 5 ka 50 Type… Its BANNED In Karnataka Yet Its Published In MARATHI News Papers and Illegally Played Here..